Welcome to the home pages of the Hudson Valley Direction Finding Association. 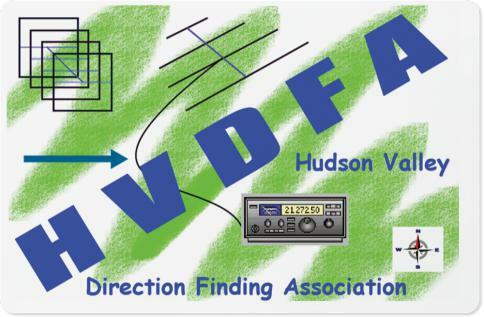 The HVDFA is dedicated to fostering skills in the area of Radio Direction Finding as an interesting facet of Amateur Radio, both as a sport and for public service, in the multi-state region surrounding the Hudson River Valley of New York. We welcome everyone to participate in our frequent hidden transmitter hunts, held throughout the region. Those skilled in Radio Direction Finding (RDF) have been called into play often through through the years to assist many public service agencies, both public and private. In critical circumstances RDF has been used to help locate the emergency beacon of a downed aircraft, to locate marine vessels in distress, and to trace sources of interference to public service agency and amateur radio communications systems. The same techniques are used to trace the migratory patterns of wildlife, as well as the flights of amateur and professional atmospheric and weather balloons. As a training ground for these activities, nothing beats using Radio Direction Finding techniques to locate hidden transmitters just for the fun of it. In all of its facets, this sport has untold thousands of participants throughout the world who race the clock on foot or in cars to be the first to find the quarry, or to find it while traversing the least distance along the way. Amateur Radio Operators in particular have known to become feverishly addicted to activities variously known as "Fox Hunts," "Bunny Hunts," or simply "T-hunts" (for Transmitter hunts). To participate in any of our upcoming events, check the Upcoming Events Calendar. Advance the calendar to see what month and day events are being held. All of our events are on 2 meters. To register for an upcoming event click here . Walk-ins are welcome to register at the staging area but pre-event registration is advisable but not required. The staging area will be emailed to you before the event. All contents of this site, including text, graphics are considered the property of N2KI unless otherwise stipulated and are protected by copyright law and may not be reproduced or distributed in any way or form, without the express written consent of N2KI. ©N2KI 2015 All rights reserved.